For better or worse, Lego have found their niche. Licensed worlds, dozens of characters and endless comedy make up each and every one of the block-building action games. 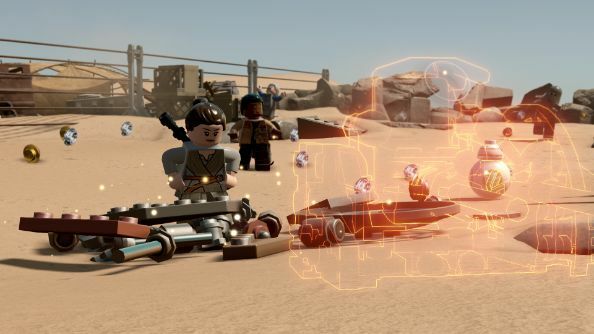 Lego Star Wars: The Force Awakens is moving on those same roads and while it’s extremely polished and far flashier than any of its predecessors, it still hasn’t shaken off the basic, somewhat unsatisfactory and challengeless core of the series. For something more promising, check the best PC games of 2016 so far. Don’t get me wrong, this edition has clearly been made with absolutely every ounce of love and attention TT Games are capable of. It’s lavishly sprinkled with details, with more in-jokes and funny background nonsense than even the previous games managed. It’s visible in everything. In one of the early levels I played, set as Finn, Rey and BB-8 escape from the various pursuing Stormtroopers on desert planet Jakku, two such foes can be seen playing volleyball in the background. I let them get on with it, rather busy with the various blasts of laser fire I was already facing down, but Goring tells me if you blow it up they’ll get in a huff and join their mates in trying to take you out. It may sound basic, but TT says there’s loads of this sort of thing strewn throughout levels and hub-worlds, from the obvious to the fully Easter egg. Previously, you’d expect to see them, but have no effect, or just blow them up and move on – here, there’s that extra bit of spice. It’s just as true throughout. Cutscenes load joke upon joke atop themselves in a dizzying stack of funnies. Explosions don’t just collapse a neat stack of blocks, they erupt carefully planned physics everywhere, showering newly upgraded animation all over the screen. The recreation of iconic scenes, characters and vehicles from the movies is immediately recognisable and dastardly cute, on a scale previous IPs just haven’t been treated to. But under all that, there’s no change to the formula – and that’s a problem. The Lego series are action games without proper combos, or any real danger. They’re puzzlers where it’s a matter of selecting the right character rather than much actual thought. They’re platformers with awkward jumping and, more than anything else, they’re still so rudimentary. Take the big additions being touted in this version, multi-builds and blaster battles. The former is more of the same, giving you another option whenever you come to a stack of interact-able bricks. Sometimes you’ll have to switch between the two, but it never looks to advance towards actual challenge. Meanwhile the third-person shooter sections hold a little more standard, gamelike promise while maintaining that child-friendly atmosphere. It’s cool that they’re adding this stuff, especially in a way where families can still play together – headshots, for example, far from creating a gory mess, simply spin helmets around so your targets can no longer see or shoot – but they’re features that were getting on a bit in Half-Life 2. 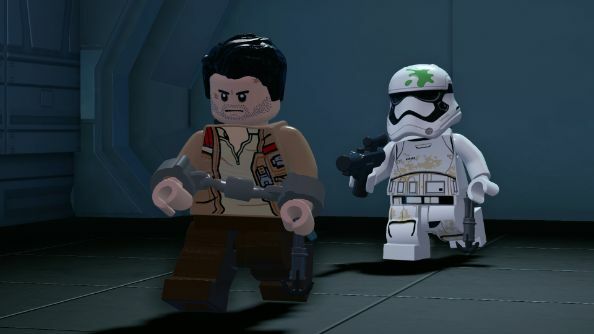 The Lego games are simply moving on a different development track to the rest of the industry, one that’s far behind and will take a long time to catch up with their punishing, regular release schedule. Goring tells me that their general release timeline is 18 months, and in seven years this is his fifth game – and that’s because he works on the longer projects. Allowing for reusing the odd brick here and there (which there is, from what I saw, very little of in The Force Awakens), that’s still a lot of work to get done. Even the yearly, big-franchise releases along the lines of CoD and Assassin’s Creed are generally made on rotating schedules of two to three years. It also eeks into game design itself. Talking about how the multi-builds push towards more complex challenges, he explains that they don’t want to go too far, but do see the demand for something with a bit more thought to it, “If you want to literally build Lego pieces then there’s this great product called Lego, but if you were to do that in a game using a controller that could bring things to a crashing halt. We’re striving to find that line that allows kids to express themselves building different things while being simple enough. The problem is that kids have repeatedly proven they’re more than capable of dealing with complex games. Their brains learn faster than ours, and on the violence side there are plenty of indie titles that are not only more innovative, but so conflict-free as to not be an issue. 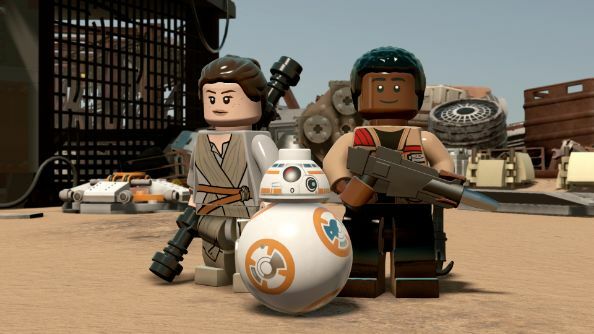 Lego has easy, free-flowing co-op and that is a triumph, but there’s little reason to do it here instead of in one of the earlier – and now cheaper – games, or some other series entirely, when more than half the fun comes from the simple act of playing with a partner. 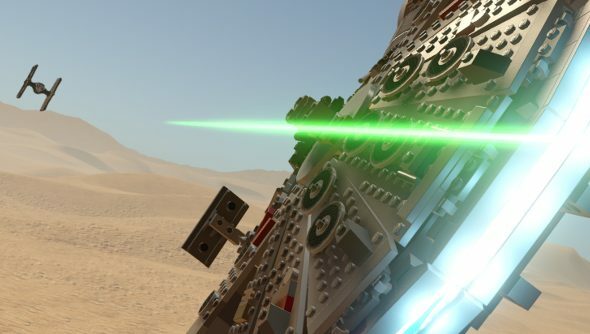 So yes, I’ve successfully confirmed that it is a Lego game, and one with Star Wars bits in it. Goring himself got to flesh out the universe a little, with new levels explaining some of the backstory to the film, and voice lines from the film’s cast – both newly recorded and ripped straight from the movie. If you were hoping for a Lego revolution, this isn’t it, but it is the nicest looking of the lot.